USA'S Justin Gatlin wins the gold in the 100 meter with a time of 9.85 seconds, just two one hundredths of a second ahead of teammate Shawn Crawford who won bronze. I have many warm and wonderful memories of the Tijuana ... errrrr. .. Athens Olympics. Not among these are thoughts of the crumbling and pitted sidewalks (3000 years of Greek culture failing to produce curb cuts), bizarre bus schedules built around cigarette breaks for the drivers, and lack of food service in the Media Gulag, aka the Spartan Arms. But all seriousness aside, it was a great time. My fondest memory is the kindness of the Greek people, especially of the Olympic volunteers. Try having thousands of visitors descend on you speaking dozens of languages and bitching about every little problem. When I finally got a plentiful supply of our little USA TODAY souvenir pins, I started giving them out at every turn. I could not believe the gratitude with which they were received. One young woman at the media village thanked me so profusely, with hand held to her heart, you would have thought I was Brad Pitt giving her a diamond engagement ring. It was a huge thrill for me to get to visit the Acropolis and Parthenon and walk among the ruins of Greek antiquity. The venues I worked in were spectacular, especially Olympic Stadium, home of track and field. And access was for the most part as good as most Olympics I have covered. 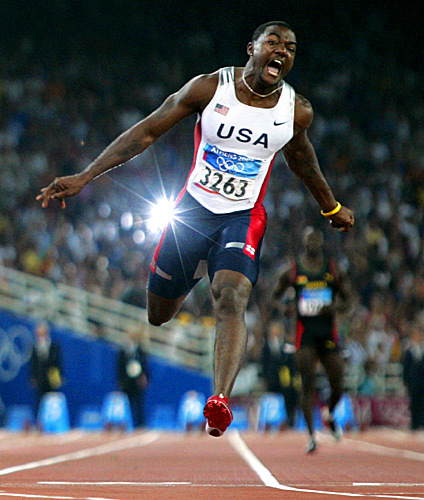 I made one memorable photo, of Justin Gatlin winning the 100-meter, thanks to Gatlin hitting the plane of focus of my remote camera with both feet off the ground, and the flash of a spectator's camera firing in the background. My trip was cut short when my wife called to tell me our younger son, eight-year-old Franky, had crashed into a sliding-glass door and had a huge gash across his stomach that required 39 stitches. He had been racing friends across a big room. I'm glad to report he won the race (no medals awarded), and more importantly he is healing fine. It was very jarring for me but even more so for my wife Margo who was with him and had to ride in a medevac helicopter with him. Many thanks to all who expressed concern.